A land of freezing winds and burning hot sunlight, a cold desert in the rain shadow of the awe inspiring Great Himalayas – welcome to Ladakh. Little Tibet’ or, ‘the moonland’ or ‘the last Shangri La’ these are all names that have been given to the cold dry and harsh land of Ladhak. Slight rain and snow reaches this dry area, where nature has created an improbable landscape. Ladakh is bounded by two of the world’s most impressive mountain ranges, the Great Himalaya and the Karokaram, Surrounded by rugged mountains this land is utterly different from the green landscape of many parts of the Himalayas. Ladakh which forms a part of the state of Jammu and Kashmir in India is made up of two administrative districts – Leh and Kargil. It covers a total area of about 59,000 square kilometers and is allied ethnologically and geologically with the Tibet region of China, the area has a predominantly Lamaist Buddhist population as it was nominally a dependency of Tibet. After 1531 it was invaded periodically by Muslims from Kashmir; it was annexed to Kashmir in the mid-19th cent. With a population of 10,000 people, mainly Buddhist, some Argoos (Muslim descendants of Yarkandi traders) and a small Christian community, Ladakh bears the distinct stamp of its mixed heritage. The Ladakh Festival is a regular tourist event on the tourist calendar. Along with the Ladakh festival, adventure tourism figures prominently in Ladakh. A white water river rafting expedition along the 26-kilometre stretch from Fhey to Nimo along the mighty Indus River is the highest point where river rafting is possible in the world. The high altitude and mountains make it an ideal spot for paragliding, mountaineering, trekking and even skiing. Ladakhis are keen sportsmen polo and archery contests are frequently arranged at the village level, which draws all aspiring marksmen. Polo, is played with great gusto reminiscent of the Mongol horsemen, this robust game is far removed from the watered down version seen in today’s polo circuits. Drass, Kargil, Zanskar, Padum, Sanku, Nubra valleys etc are beautiful places and must be visited when in Ladakh. The sleepy pastoral countryside of Nubra which has recently been thrown open to tourism is located on the Indo-Pak border. 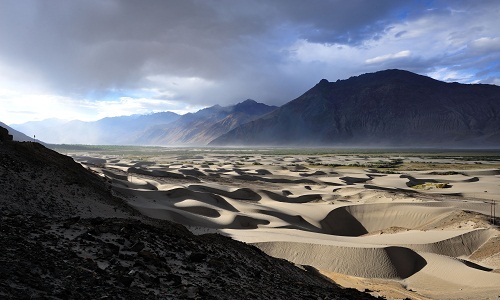 In Nubra one sees the co-existence of water, mountain and desert-a rare and thrilling sight. Amidst starkly beautiful and majestic mountains, is Leh, the capital of Ladakh, the roof of the world. It is located in the Indus river valley at a crossroads of the old trading routes from Kashgar, Tibet, and Kashmir situated on the banks of the Indus, at a height of 11,000 feet. It is a stunning and magnificent region, watered by the Zanskar River, which flows into the Indus River just below and surrounded by snow-capped peaks. Leh is a truly beautiful milieu with many attractions and gorgeous surroundings. It is the center of Tibeto-Buddhist Culture for ages. Its colorful gompas have attracted the devout Buddhists from all over the globe. Besides, it is also a favorite hiking place, known for some of the best hikes in the country. A miniature version of the Potala in Lhasa, the Leh Palace is one of the major attractions in ladakh. The nine-storeyed palace was built by the 17th century illustrious ruler of Ladakh, Sengge Namgyal. It is an imposing structure, now in ruins; it is situated on a hill and commands a grand view of the Leh town. Within the palace are Buddhist wall paintings, centuries old ‘tankas’ or painted scrolls and other artefacts. Above the palace, at the top of the Namgyal hill, is the Victory Tower, built to commemorate Ladakh’s victory over the Balti Kashmir armies in the early 16th century. This palace built for King Singge Namgyal, now houses the Ladakhi branch of the Indian Government’s archaeological conservation organisation. Namgyal Tsemo, the peak overlooking the town, is the ruins of the fortbuilt, by the king Tashi namgyal in the 16th century, as a royal residence. The mosque, city palace, the bazar and the gompas, are all within walking distance. A memorable sight of the Leh bazar is the group of women, traditionally attired, selling fruits, vegetables and household articles, spinning and knitting, and exchanging gentle banter between themselves and with passers-by. Shey, Spituk and Phyang monasteries are quite close while Stok, Matho, Thiksey, Stakna, Chernrey, Hemis, Likir, Basgo and Alchi monasteries are all a day’s touring distance. Rumbak and Markha offer exciting treks, while Stok Kangri is the best for a climb. Boating and river running too are possible on the Indus. Leh, the principal town of Ladakh has now become gateway to the world, one can fly in to Leh from Delhi, Chandigarh, Jammu and Srinagar as well as abroad all through the year. There are two land ways to Ladakh. The main overland approach to Ladakh is from the Kashmir valley via the 434-km. Srinagar-Leh road, which remains open for traffic from early June to November. The J&K State Road Transport Corporation (J&KSRTC) operates regular Deluxe and Ordinary bus services between Srinagar and Leh on this route with an overnight halt at Kargil.Taxis. cars and jeeps are also available at Srinagar for the journey. Groups can charter Deluxe and A-class buses for Leh, Kargil or Padum (Zanskar) from the J&K SRTC at Srinagar. Manali-Leh roads is the second land approach to Ladakh, open for traffic from around mid-June to early October, this high road traverses the upland desert plateaux of Rupsho. A number of high passes fall enroute among which the highest one, known as Taglang-la, is the world’s second highest motorable Himachal Pradesh Tourism, H.P. SRTC and J&K SRTC operate Deluxe and Ordinary bus services between Manali and Leh Ladakh Tour Package from Delhi. The bus journey between Leh and Manali takes about 19 hours or two days with an overnight halt in camps at Serchu and Pang. Gypsy and jeep taxis are also available, both at Manali and Leh.